As in ancient times Rome is a center of transportation. It is the focus of international traffic by road, rail, sea (at the port of Civitavecchia), and air (at Leonardo da Vinci international airport at Fiumicino) and is as well a cultural, religious, political, and commercial center of international importance. Public transportation in Rome is provided by an elaborate bus system. A subway, the Metropolitana, was opened in 1955. Rome's large number of automobiles has caused serious traffic congestion, and in the 1970s and 80s various attempts were made to deal with the problem, including the banning of traffic in certain parts of the city. 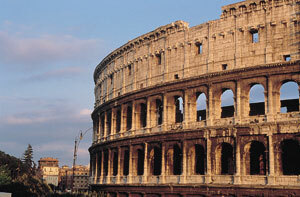 The economy of Rome depends to a very large extent on the tourist trade. The city is also a center of banking, insurance, printing, publishing, and fashion. Italy's movie industry (founded in 1936) is located at nearby Cinecitta. The economy of Rome is characterized by the absence of heavy industry, but commercial activities especially banking and the development of tourism are extremely important to its economy. Universities, national radio and television and the movie industry in Rome are also important parts of the economy. A phenomenon particular to Rome is the widespread incidence of double employment, people working two jobs.